Tea and little cakes can be found on Timber Hill in Norwich city centre, not far from The Murderers pub. At the rear is the open plan kitchen. Inside there is a modern mix of kitsch and contemporary. There is a full waitress service. Breakfast is served till 6pm! The salt/pepper dispenser worked amazingly well. The tea is served in a tea pot, nice. This is the big talc brekkie. This is the veggie brekkie and it was screaming out for a veggie banger or two. Having visited a couple of new cafe's in Norwich recently I was delighted to hear that another new place selling cooked breakfast had opened in Norwich, this time on Timber Hill. As they served breakfast throughout the day I was able to meet my fiance for lunch, she is not a vegetarian but told me she would try the veggie option. Great I thought, meat and veggie breakfasts both tested in one visit. Veggie option - Yes, as pictured above for £6. I really do think that a veggie sausage or something similar needs to be added though as just serving something without the meat does I'm told frustrate and irritate vegetarians. *Update* The owners have said they will soon be adding something to the veggie breakfast which is great news! Here is the veggie breakfast with the potato rosti which i am told is delicious! 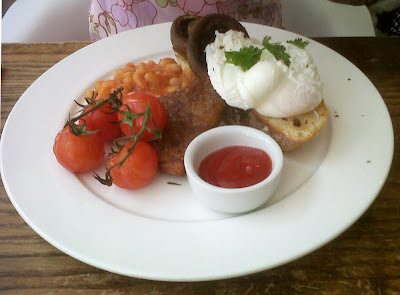 The veggie breakfast was looking great with perfect poached eggs. I tried the potato rosti this time and it was so good, as was everything else! Thanks for giving us such an amazing review. All the hard work and planning has obviously paid off :-) I have taken on board what you said about adding a little something to the veggie brekkie, and we have come up with a solution. Thank you for opening such a great place! The addition to the veggie breakfast is great news and I'm sure it will be delicious. You are the 1st place ever since starting my blog to score a perfect 10/10 for presentation! Keep up the good work and looking forward to visiting again soon. I'm hanging to try this place after this review. A good breakky isn't that easy to find, and those photos make it all the more inviting! Well done on the blog and your mission - a very important one! Next time I'm in Norwich, I'm making a bee-line for this place. Thanks! Visited this place after reading this review and really enjoyed it. The atmosphere and food are both great. They forgot my potato rosti (the new veggie addition) but once made aware, quickly brought it over and it was worth the wait. 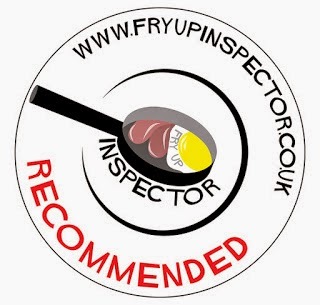 Thanks for pointing this place out Fry-Up inspector - we've lived in Norwich for years and didn't know it existed. Lovely food but came out stinking of cooking! Right, this is the one we are trying next time we go out ;) Those poached eggs look delicious! Been here twice now and both times its been excellent, reasonably priced, accommodating staff, willingness to flex the menu to suit my complicatedly allergic sister, great atmosphere and very friendly. Definitely a gem and worthy of the inspectors seal of approval! Thank you inspector for your hard work! Really recommend the TALC Big Brekkie, one word AWESOME! We went to tea and little cakes a while ago and found the breakfast was fantastic, however, I would urge you to go back and check it out again as we did recently. The breakfast was awful, the eggs benedict where hardboiled, the bread soggy, the potato rosti burnt to a crisp and the service poor. the only saving grace was the coffee! I will pop back and try the breakfast again soon, thanks for the reply. Thanks, I thought I had marked it as closed.